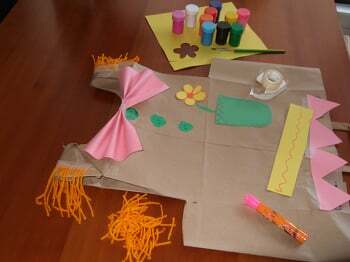 Have a blast with your child helping her create a self-portrait puppet! She can use it to stage her own puppet theater and for storytelling. 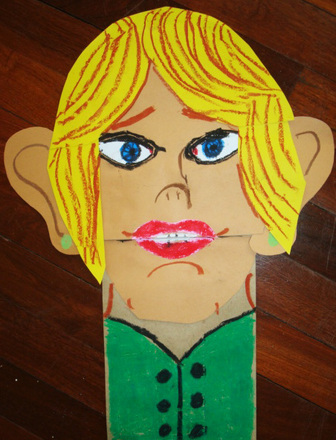 This project is helpful for children to learn the parts of the human face and practice cutting and gluing. It's great for groups of kids at birthday parties, sleepovers and summer camps. Discuss with your child what the parts of the face are, and what color her hair is. She can now cut out each of these parts. She may require a bit of help from mom or dad to cut on the lines with safety scissors. She can glue the top of the head starting at the top of the bag. Her paper chin can be glued under the fold of the “bottom” of the bag. Finally, she can glue her ears onto either side of her face. Now she can draw out her hairstyle on construction paper, cut it out and glue it so it overlaps the ears! Help remind her of the parts of her face and she can draw and color them onto the face of the bag. Make sure the top part of the face ends at the fold of the bag. After drawing the eyes, nose, lips (bottom lip on chin piece), she can draw lines or hair ornaments on her paper hair and add final lines inside the ears. Finally, she can draw in any clothing she would like to wear on the bottom part of the bag. Tip: If you have time and materials, your child can add on arms and hands from behind the bag to create even more personality! Give this lion his roar back, and put on a show with a fun paper bag puppet! Your child will love creating his own toy puppet. This adorable paper bag puppy is just begging to be brought to life! Share a fun paper project with your child, and make an animal puppet. Little theater-buffs in training, enjoy a fun arts and crafts project where your child will make his own paper bag puppet! Enjoy a fun recycling arts and crafts project with this raccoon paper bag puppet. Your child will love creating his very own toy. Share a fun, recycling arts and crafts project with your child, and create your own paper bag puppet. He'll make his own paper bag puppet, and learn a bit about the beaver! This paper tiger needs some help finding his voice! Can your little theater buff lend a hand? Share a fun paper project with your child, and create a puppet. 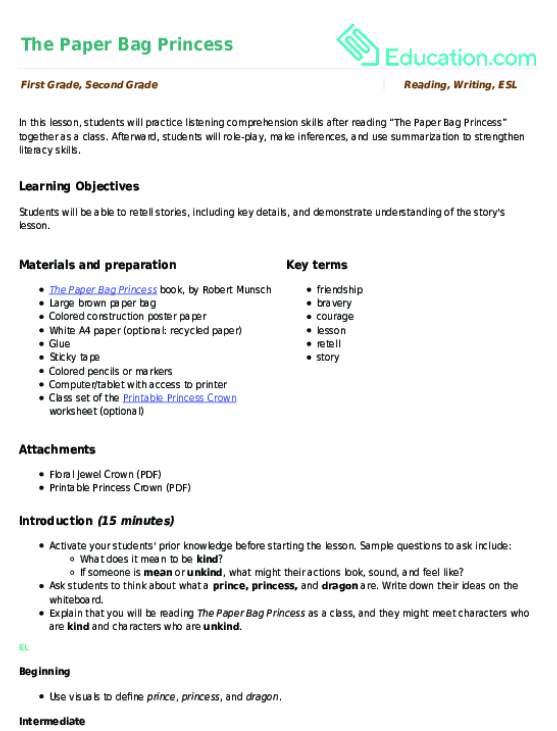 Your child will make his own paper puppy puppet. Meet Marvin, the paper walrus! Your child will love putting together his very own toy with this fun, recycled arts and crafts project. Take a break with a paper bag costume. A great rainy-day art project.